← Know Your Friends… and Your Enemies! The testing insanity has to STOP and every one of us needs to join together to make that happen…. 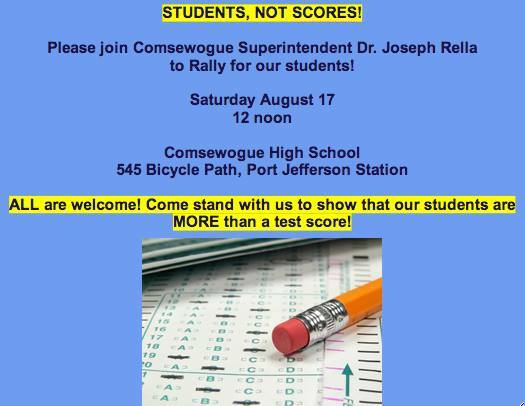 Comsewogue Superintendent Joe Rella and the PJSTA invite you and everyone you know to a rally next Saturday to make our voices heard… Right now Engelbright will be there and we are working to get other State and Federal Representatives to the rally too…. Please post this on your facebook pages, distribute it to your members, Superintendents, school boards and every friend of public education you know… Click below to read the letter Dr. Rella wrote to our local leaders and community members…. . Ask your Superintendent to do the same…. This entry was posted in General and tagged Public Ed, rally, testing. Bookmark the permalink. 3 Responses to Let’s Have a Rally! Will do my best to be there. Keep tweeting about the rally. I’ll be with you in spirit! Situation is the same in GA, and no end in sight. Wish we had strong unions down here to help.